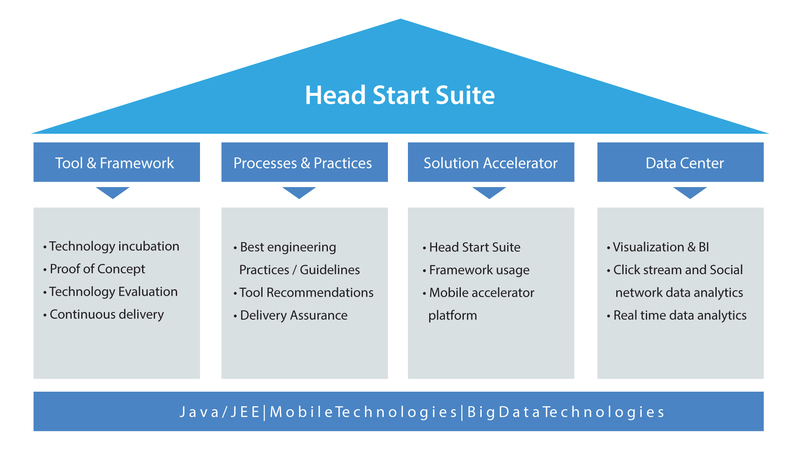 Head Start enables businesses to develop, deploy and manage applications easily. It is a rapid application development solution that provides flexibility resulting in the reduction of manual coding. It encourages user involvement and there is a possibility of lesser defects due to prototyping in nature. A tooling framework which provides integration with multiple APIs such as REST/WS to empower innovation and faster time-to-market application. It orchestrates workflow for business integration and built-in code optimization for improving code quality. Businesses get a reliable comprehensive application solution that enhances the agility of the application. Head Start also incorporates the usage of APIs and SDKs that helps to draw data and manage computations, analytics are also improved, allowing businesses to track and view the growth metrics of the application without negatively impacting on performance. A broad, strategic visualization of data elements by rational, consistent and simplified database modeling supporting planning, building and implementation of data systems. Easily connect with data sources and embed data elements. Advanced tools are integrated such as Sonar for code quality management, Jenkins for continuous delivery, and JavaMelody for monitoring app performance after deployment. Records, measures, and analyses key performance metrics by creating information-rich reports that helps in taking business-centric decisions. It streamlines business operations, creates efficient enterprise reports, and provides proactive analysis. Provides efficiency-focused and configurable features including resource management, user management, auditing support and multi-lingual support to improve automation processes to create a quick and efficient business management system for users and management.